Unleash Your Child's Super Powers TODAY! Get the Print Book Today! If you’re a parent looking to give your child an advantage in school and in life, you’re in the right place. Whether you’re new to parenting or a veteran, you want your child to grow in confidence, competence, and reach his or her full potential. With increasing focus on testing and a one-size fits all mentality in schools, your child is not being guided to reach the potential you know is inside. And the very classes that allow kids to grow in self-confidence, develop into leaders with great character, and foster service for community — the arts — are a dwindling commodity. Your Child Is NOT Average! Like a fingerprint, each of us learns in our own unique ways. In fact, each of us has 8 Super Powers that shape how we learn. Only two make up the bulk of teaching and testing in our schools. TWO of EIGHT! This can leave many kids being labeled as “average,” or worse, “below average” based on standardized test scores. How to communicate these Super Powers with your child’s teacher to create learning experiences that are meaningful and engaging, creating a true love of learning. It’s time to unlock and unleash your child’s Super Powers and begin raising a Superhero today. The book is a quick read with so much valuable information!!! I was privileged to be the editor of Ms. Pratt’s eye-opening book on teaching through the arts. 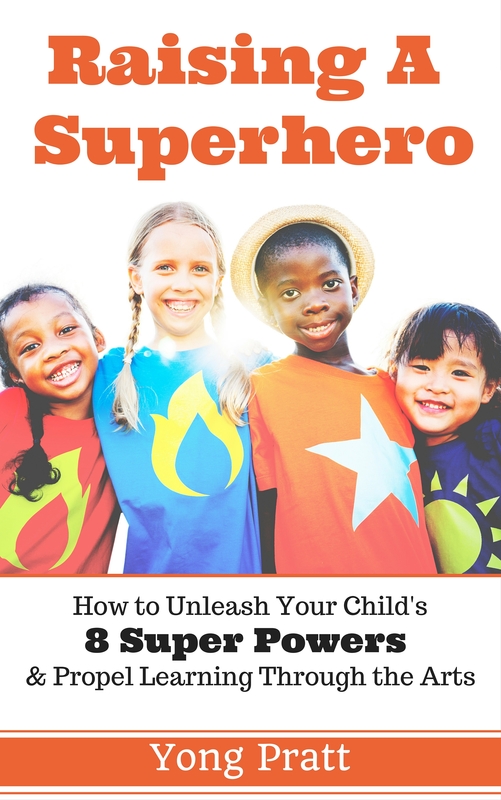 This book is an easy and interesting read for any parent who wants to embolden their children to have confidence in their innate super powers…and have fun while doing so. Not only do I wish I had this book to help my son when he was a child, it also helped me to learn about my own super powers…as a child and today. To get the most out of the book, we recommend getting a paperback copy of Raising a Superhero so you can take notes, write notes in the margins, and highlight to your hearts content. The book can fit easily into a purse or backpack for easy travel and can be used as a reference when meeting with teachers or administrators. Great read for parents, grandparents and teachers! I loved the focus of positive reinforcement and arts-based education to help children grow. Making homework time and parenting a bit more fun!! As I just finished reading this book my mind is buzzing with all kinds of fun ideas and activities I can do with my kiddos. So many of the 8 Super Powers/Learning styles match with each of my kiddos various personality pieces. Not just one, but multiple styles of learning and absorbing the world around them. We all want to be special and so do our kids! This book is a must for all parents. We all want to be special and so are our kids. Being able to unleash your child’s super power is PRICELESS!